After our success at the 2003 Australian International Beer Awards, our brewmaster, Mr. Nakanishi, set his sights on creating a beer that would exceed the successes of our Pale Ale. The result was Brown Ale. 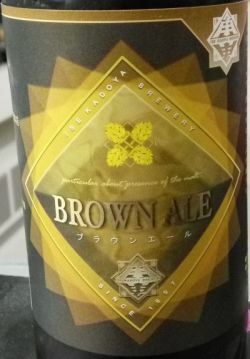 By using the ideal combination of four different kinds of hops Wonderfully layered, Brown Ale has a delightfully broad range of aromas and flavors that compared with Pale Ale, is slightly more complex and richer. This complex yet smooth ale is a testament to Ise Kadoya’s continuous efforts to creating a better beer. Bottle sample at a tasting at Na’ama’s place. Thanks Na’ama. Brown color with a beige head. Aroma of malt, nuts, caramel, toast, some hops. Sweetish flavor with malt, nuts, toast, bread, caramel, and a bitter hops finish. Medium-bodied. Quite nice. An okay brown ale. Not as malty or roasty sweet as a typically prefer, but it has a sweet caramelly character that is pretty good. Draught at Bulldog. Sweet caramel, chocolate, mild dried fruit, herbal hops, touch of licorice, dry finish. Nothing too exciting but not bad for the style. Old rating. Bottle from Liquors Hasegawa. Poured into a shaker pint. Amber brown color with a small head. Solid lacing throughout. Aromas of toffee, roasted malt and some spice (nutmeg? ginger?). Taste is more of the same with chocolate coming out as it warms. Hoppy bitterness on the palate as well but balanced with the malt fairly well. Long dry finish. 330 ml bottle. Pours nice medium brown, small head, nice lacing. Aroma has some lacto, bit of milky chocolate. Toffee. Taste is actually nicely hoppy, revealing American side of this beer. It does say American Brown Ale on the label. Bitter chocolate. Finish has more roast, lasts quite long. Body feels a bit weak though, although flavours are there. Good and enjoyable brown ale, I like it. Bottle from the Ise Kadoya satellite shop in front of Ise Grand Shrine (Geku). Sweet roasty nose, piney hops,light caramel. Translucent brow. Lightly tangy, good roast malt, spicy hopping. From late mid palate, it goes a bit dull, with some bitterring and a bit of sourness. Thin-medium body. Very hoppy for a brown ale. Bottle: Cloudy brown with a tall beige head. Caramel, wood aroma. Taste is earthy, light caramel, slightly tangy nut. Herbal and earthy, root-like hops... Odd, but interesting. Bottle. Earthy floral toffee malt aroma. Hazy brown with giant, explosive head. Lightly sweet perfume/floral toffee malt and lightly bitter herbal flavor. Different. Draught at Ise Okage Yokocho. Dark amber, medium head. Aromas of yeast and caramel. Lovely texture- medium body and perfect carbonation. Sweetness came out as it warmed- stone fruit, dark sugar and a pleasing bitter finish. Excellent. Good easy drinking Brown ale. Well balanced and not too bitter, but has little to excite.